Surfer Dudes there are so many fun things to do with pets in Laguna and Newport Beach you’ll be amazed! 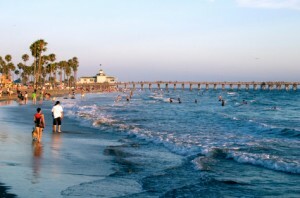 The beaches of Orange County are idyllic and beautiful, like picture postcards come to life. Laguna Beach and Newport Beach offer plenty of fun for both human and hound, making living the Southern California dream a must do when you vacation on the Laguna/Newport Coast. Dog friendly beaches line the coast of Southern California, the trick is just knowing which ones they are! Corona Del Mar, a community in Newport Beach is dog friendly and a bit social activity for pet owners in that area. Generally, with the exception of Crystal Cove, pets are allowed on the Balboa/Newport peninsula beaches prior to 9am and after 5pm. At Crystal Cove State Park, dogs are only allowed on leashes on the paved paths of the park. Try going for an early morning run or sunset jog along the sand with your dog like true Southern Californians do! While in Newport, be sure to check out Fashion Island – where almost every shop allows dogs – even in the dressing rooms! While there, be sure to check out Muttropolis, a shop that bills itself as “A Utopia for Pets and their Parents.” Muttropolis maintains a busy calendar of social events for pets and their people, with events for pooches and their parents to meet and mingle. If your stomach starts growling while you and your dog are shopping at Fashion Island you have three dog friendly options: Francoli Gourmet Emporium, Red Robin and Café Beau Solei. All three restaurants have dog friendly patios and are accustomed to having canine diners in their midst. And, there are plenty more pet friendly restaurants in this area that can be located via the Laguna Beach Travel Guide. With so many pet friendly options for hanging out on the Newport Peninsula, the area gets four paws up from our canine companion. The only off leash all dog all the time beach in Orange County is Huntington Beach’s Dog Beach. This is a heaven on earth for dogs and the people who love them. Frolicking in the surf, chasing Frisbees down the beach, playing with other dogs – this beach is a little slice of perfection in Orange County. Vacation Pet Friendly has the largest inventory of pet friendly hotels in the Newport Beach/Balboa Island/Laguna Beach section of Orange County. From the Hilton to the Fairmont, Newport Beach’s dog friendly hotels will make your hound feel right at home. If you’re staying in Laguna Beach, you can book one of the many beachfront hotels that allow dogs as guests. No matter where you stay, one thing is for sure: Newport Beach and Laguna Beach are a dog’s dream destination! So if you’re planning on traveling with pets, you just may want to put Laguna Beach and Newport Beach on your itinerary. Remember, booking early is essential when traveling with pets. See what’s available today so you get the best deals. Start your search for pet friendly hotels in Laguna Beach or Newport Beach here. Then sit back and think of all the fun things you can do when you get there!